The mulching attachment for the 42-in. Mower provides excellent performance. 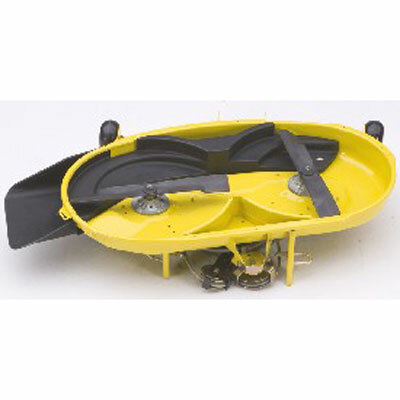 This is a high-performance mulching attachment that includes a mulch plug and special mulching blades. 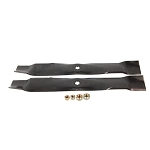 The blades included are designed to work with the StarLock blade mounting system used on 42-in. Mowers for 100 Series and X300 Select Series Tractors and also for the 42-in. Mower without the StarLock system used on LT Series Tractors. The special mulching blades included can also be used for side discharging, although the overall cut quality may decline slightly. Grass Bag? I need no stinking Grass Bag! When I bought my mower, the dealer insisted I needed a grass catcher. Several hundred dollars later, I'm bagging grass, dumping heavy bags, having to stop and clear the clogged shute. Now, with the mulching kit, I mow one way and then the opposite way and my yard still doesn't look like a golf course but looks really good in half the time. Now I have much more time to stand around, lean on my Deere and discuss nothing really important. This kit has definitely improved the mulching performance of my D300 over the simple port plug. It takes a bit of work to install, but the easiest way is to remove the deck, insert the plug through the port and then fit the bolt through the deck hole and fasten with the nut before trying to fit the other end in place. A little grunting will do it. I can't imagine trying to install it with the deck in place.. The mulch kit fit my John deere as stated and very easy to install. Remove blades slide shroud in and install the bolt in pre drilled hole in deck. Installed new blades and your done. Total time of install only took 15 minutes. Does a great job mulching up leaves. I received this item and had my son install it. Everything was pretty easy except for one thing. The bolt the wingnut screws onto didn't quite line up with the hole on the deck. It just barely missed it. We had to drill the hole on the deck out just a hair bigger to get the bolt to line all the way up. The mowing results were great. The grass looks great. It seems to mow better. I would definitely recommend the product to other buyers. I received this product in a very timely fashion and it was extremely easy to install. Removed the deck for installation as I have found it easier to change the blades anyway. Was up and running with the new kit in less than half an hour. Works extremely well on my X300. It was a tight fit, requiring a rubber mallet to get it properly on the 42C mowing deck that comes with the Z235. The result is a nice clean cut with the mulch blades that come with this mulch kit. I do have some Gator Blades on order and will try those when they arrive. I hope to update this review once I have a chance to use them. I got this for my John Deere Z225. After about 8 years of frustration with the terrible mulching performance of my zero turn, I tried this mulching kit. I also upgraded to the Gorilla blades from Oregon blades. I wish I would have know about this years ago. The cut is beautiful!! I recommend this mulching kit! shipping was fast, installation much easier than i thought. no more bagging. I agree with other reviews that the bolt doesn't easily line up, but a few taps with a rubber mallet and all is well. So happy that the grass doesn't clump when cutting. For that alone the mulch kit is well worth the money.Extremely fast shipping!! Excellent product! and Excellent supplier!!! This kit works great!!! Don't hesitate to get it. The only complaint I have is the the bolt was very difficult to line up with the hole in the deck, but other than that the mulch kit works awesome. I got this mulch kit after the growing season and I used it a few times and it works great. I've even used it on the leaves in my yard and it mulches them up very good. It's November and I can't wait for the rest of the leaves to fall off the trees so I can mulch them up. The mulch kit is an excellent product and I wish I had bought it sooner. All residential mowers should have a mulching deck or an insert as it chops the grass excellent and does not make a mess with the grass shooting out of the deck all over the place. It was tricky getting to in properly, but I took the deck off and used a rubber mallet to get it in properly. Highly recommended! !